I feel like I have sailed over continents and swum oceans since my last blog entry. 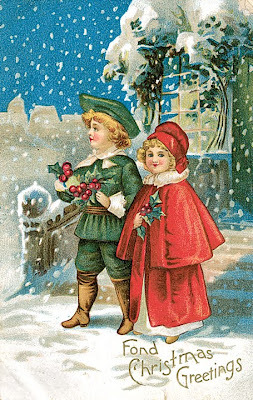 But actually it's just been a normal Christmas and New Year's for us. My son came home for Christmas- the first time in 7 years. 6 wonderful people came to stay at our house for a week. We went to the opera, rode in a big horse-drawn sled, visited a gorgeous castle, ate in Karlsruhe's tallest restaurant, shot off mega-tons of fireworks on New Year's Eve, sang karaoke, and drank astonishing amounts of beer. Someone threw up in our basement on New Year's Eve. The dog stuck a stick in her eye and now she's partially blind. After 9 washing machine loads of bed linens and guest towels we are finally caught up in the laundry department. 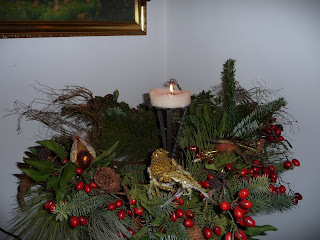 As you can see from the picture, my Christmas candle has almost burned itself down and out, so that means it is time to take down the Christmas decorations. Time to get back to work. Time to go back on Weight Watchers. Things are hectic. But very very fulfilling! Sorry this will be super short, but Eddie and I have our next to last concert tonight. Every single one of the concerts has been sold out and the reponse to the program and the new album "Inner Sanctum" has been phenomenal. In all the hullabaloo, a friend send me this little video which has absolutely made my day. Everyone who has a dog or loves dogs will LOVE this, 'cause they know it's true. Tomorrow we finish up our series of Christmas tours with a concert that will be filmed for a EPK. (Electronic Press Kit). So, if you're there, maybe you'll be in the video! :) So wear something brightly colored so that you can spot yourself in the film! INNER SANCTUM has arrived!!! I actually held one in my hand- and I have a hallway full of boxes full of INNER SANCTUM CDs full of lots of Cae & Eddie & Florian and amazing, timeless music. I just got back from the Beauty Salon. I only go twice a year. (I know! Unbelievable!) One of those times is the week before our first Christmas concert. Sooooo, guess what's on the very near horizon? Yup. Cae & Eddie Christmas concerts! Yippeeeee! It is state-of-the-art high tech and just perfect for our "made-by-hand" vocals. Thank you, FOHHN ! The rehearsal went surprisingly well considering I have a nagging cough, and Florian had just gotten home from a Söhne Mannheims concert in Hamburg in the wee hours of the morning. At some point we discovered that we all had a bit of a headache so we all felt sorry for each other and ourselves. A bonding moment. We really like the program that we have put together. There are some tried and true numbers, some new songs from our new album, "Inner Sanctum", and, of course, some surprises. Our first concert is this Sunday, December 6 in Russheim. Then on Monday we will be singing in the Kammertheater in Karlsruhe. We've put together a slightly altered program for that audience to accommodate the "theater" atmosphere. Edo Zanki will be singing with us on at least 1 song. That will definitely be fun! If you want to know where the concerts will be you can find the schedule on my website: www.caegauntt.de and then click at the bottom under "Meeting Places". So many things to think of. Transportation, sound system, health, program, dog-sitter, what to wear, texts, Lifelines and CDs. WE'RE GETTING OUR NEW CDS DELIVERED - TOMORROW!!!!!!!! We are so excited. Soon we will actually be holding the baby in our hands. What a long birth this has been. So, dear Reader, this was just a quick note to get you up to date. Gotta run, because I've got a couple of people coming to look at Lifelines BEFORE they are for sale at the concerts. They want first choice. Whatever they don't buy, I'll have with me on Sunday in Russheim. I want you to know that even when I don't write in my blog, I'm still thinking about you. It's true. But sometimes, thinking is all I do and I can't drag my sore, feverish, coughing body to the computer to write to you. Even though I have soooo much to tell you. I have my fabulous sideboard now! Remember me telling you about the carpenter that I met who set about to build me a sideboard? 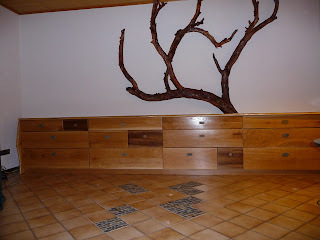 He made it from German oak and walnut and even made the drawer pulls out of slate squares that we used on the floors. 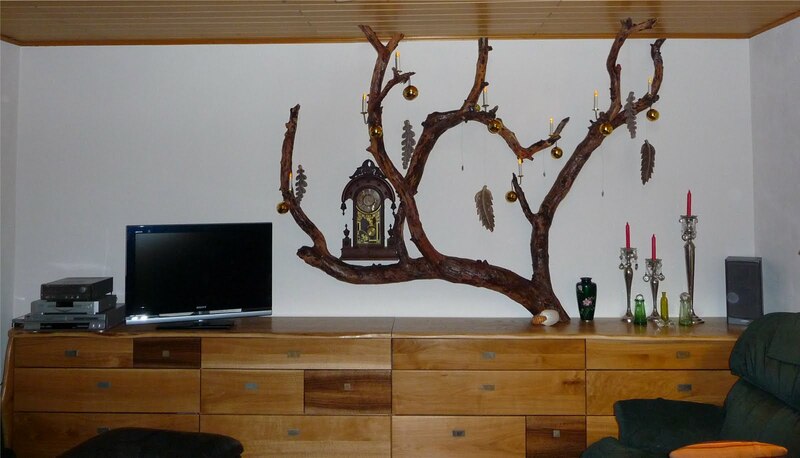 And then he set on top, exactly how I wished, a squirmy, twisted plum tree. I've put up the picture so that you can see for yourself how it turned out. He, Frank Roth, is an artist. And a perfectionist. And I am honored beyond words that he would take time out from his family to make this gorgeous piece. I will cherish it for the rest of my life. Last weekend I served on the jury of the Werte Awards (Values Awards) in Schwäbisch Gmünd. This is an award that is given every two years to people who have served God and others selflessly either through volunteer work, projects, or courageous actions in everyday life. During the process of familiarizing myself with the various candidates, I was required to read through about 35 heart-wrenching bios. People who have opened their homes and their lives, and given generously to total strangers and embraced the unlovely. Honestly, this was one of the most humbling experiences I have ever had. I don't know what made me qualified to judge these people. Next to these Ambassadors of Compassion , I am a pauper. 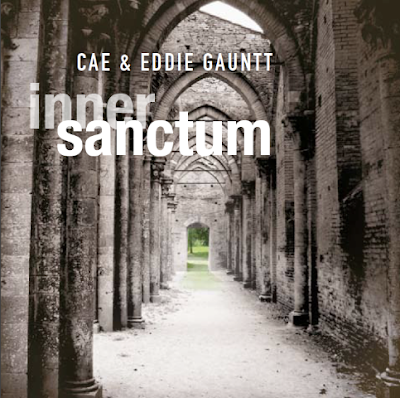 The big news of the day: today, this very day, the graphics were finished for the CD booklet of "Inner Sanctum". Bernd Hartwig, the graphic artist, has stayed awake for the most part of the last 2 nights putting the finishing touches on the booklets. And I love the results! This means, barring any unforeseen glitches at the press, we will have the new CD with us for the Christmas concerts. We're scheduled to have our first Christmas concert rehearsal with Florian, who has been crazy busy with Söhne Mannheims, on Friday. We will then get the final set list put together and work out an arrangement or two. We are tremendously excited to be premiering several of the songs from the new album. Hope you like them! I've been busy every evening making new Lifelines for you. I want to have a nice selection with me at the Christmas concerts. This week I've been making a lot of black Lifelines, simply because that's how it felt inside my head. Black! I HATE being sick. (I don't know anyone who enjoys it) In my mind though, I was just busy building antibodies to give me immunity from all the creepy crawly little flu bugs that seem to be everywhere right now. I hope YOU are staying well. Luke is in the office while I'm writing this blog, listening to various Mozart recordings. He has decided that he appreciates Mozart's order and clarity of composition. I couldn't have said it better myself. And I studied music for 100 years!